I just received an e-mail message from Rabbi Mitch Cohen, the director of the National Ramah Commission which oversees all of the Ramah summer camps. In his message, Mitch describes the Facebook project taken on by Ari Magen, an 11th grader who used to be a camper at Ramah Poconos. Ari created a Facebook group encouraging all his friends to wear their Ramah Poconos t-shirts to school on November 15. When he began this effort in September, he had no idea how powerful a tool he was creating for the entire Ramah camping movement. According to Ari, over 1000 Ramahniks saw his message and joined the effort. As I was reading Mitch Cohen's e-mail about "Wear Your Ramah Shirt To School Day," I thought how funny it would be if I was wearing a Ramah t-shirt today by coincidence. 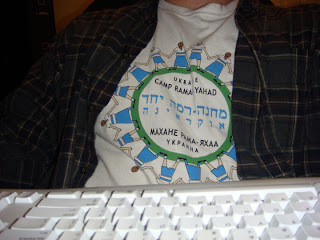 I unbuttoned my flannel shirt and looked down to see that I was in fact wearing a Camp Ramah Yahad in Ukraine t-shirt (pictured). Without even trying I participated in this effort. I went on Facebook and created an event called "Wear Your Ramah Shirt to School Day." When I created it, I was only thinking about the Poconos campers wearing their shirts. I didn't even think about the other Ramah camps. I was very excited for all of Ramah in the Poconos to don our latest Ramah Shirt. On everyone's profiles, groups, and events there is a feature called a "Wall". The wall is a place where people can just write stuff and it can be seen by whomever visits the event site.. The next day, I logged on and started to see comments on the events wall. I expected to see a few comments from my friends, but I realized that these weren't chanichim from Poconos, but from all of the other Ramah camps. Since I intended for the event to be just for the Poconos, I was very surprised to see other people joining in. But, when I went back and re-read the title of the event, I realized that Poconos wasn't in the title. You know how every camper thinks their Ramah is just "camp." Then, I thought "Wow, this was a great mistake that I made!!" I began receiving questions such as, "I was in Israel this summer, can I still participate?" or "I work, can I wear my shirt anyway? ", or I wasn't at camp this summer but I want to join in. Is that okay?" and my favorite question was, "I wear a uniform to school, what should I do?" Realizing that people were taking this so seriously, I changed the description of the event to, "Wear your latest Ramah shirt to show your Ramah pride!!! If you wear a uniform I'm very sorry you can't wear it to school. This is open to all Ramah camps, from Poconos to Israel and everywhere in between!!!! If anyone has any questions or comments, please feel free to message me." Every couple of days I checked to see how many people were "Attending". After the third day or so it had reached 100 people. After about 3 weeks, there were over 900! Then I put out a challenge to try and get to 1,000 people. By the time I went to bed last night (after choosing which of my many Ramah t-shirts to wear), there were 1058 people. Make that 1059 Ari. Even if #1059 was by accident.